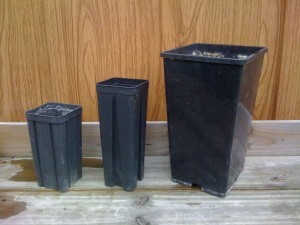 Which size plant container do I need? After buying or receiving a plant, the plant often has to be repotted. During cultivation and transport, the plants are kept in relatively small pots for economic reasons. But which pot size can be used? In this article we give you some tips. 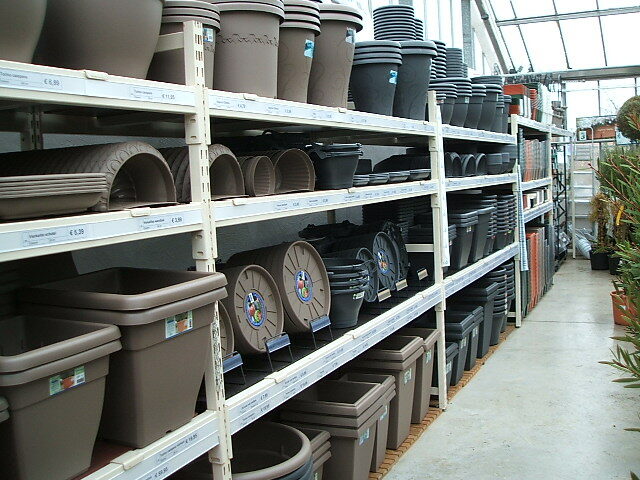 It is certainly a familiar feeling, all those different sizes and models of pots in your local garden center, often a large shelf full, but which pot is the right one? 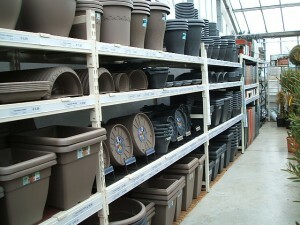 For plants sold through webshops, the pot size is often described as code C1.5 or P9, for instance. The “C” means container, the number refers to the volume in liters. A C10 therefor means a 10L container. The “P” means pot, the number refers to its size in centimeters. A P9 is therefor a 9×9 cm pot. Which type of container to use? 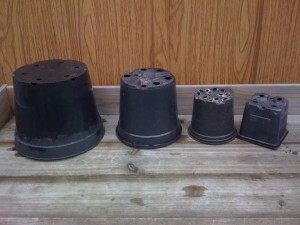 Each type of pot has its own specific qualities. For instance, plastic pots retain moisture longer and are much lighter. Stone pots (pottery) are more breathable and the water can evaporate through the material. These pots are however a lot heavier, certainly once filled with potting soil. The choice depends on your personal taste, possibly in combination with the needs of the plant. The most important thing is that in any case, the pot also contains drainage holes at the bottom of the pot. 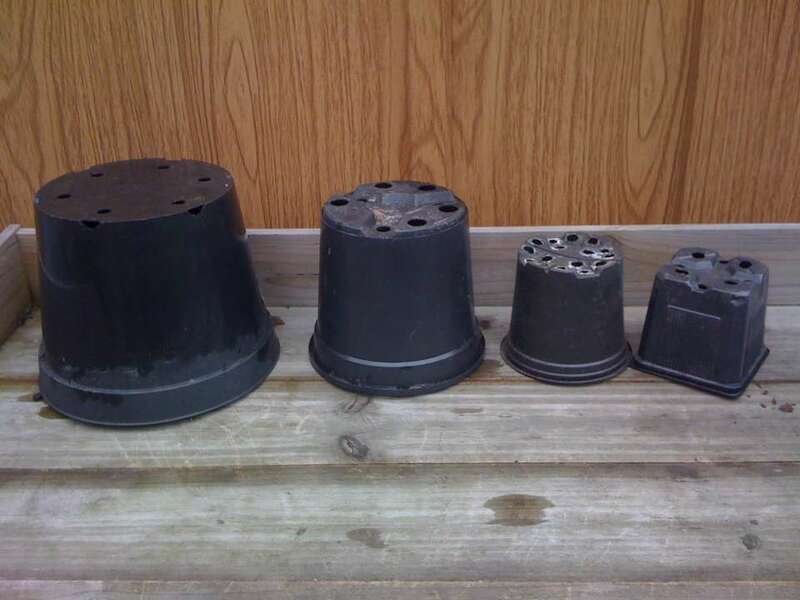 In plastic ornamental pots, there are often notches provided so that you can drill the holes yourself. If you want to use a pot without holes, place the plant in a slightly smaller plastic container and put it into that closed pot. This way you can still throw away the excess of water. Take care when pots have an overhanging edge or are shaped like a pyramid. These shapes can make it extremely difficult or impossible to re-pot the plant afterwards when the pot is filled with roots. Also keep in mind that some plants can literally break a pot once well rooted. For instance, the Strelitzia is known for this. There is no real rule for the size pot to use. Usually one or a few sizes larger is sufficient. The overall appearance must be right. A pot too big is just as strange as a pot too small. Only use a very large pot with plants that also grow very quickly. Not only does it look very strange otherwise, the water management in a pot that is too big is also more difficult to control and the potting soil can rather become moldy. Plants with large leaves or on stems quickly tend to blow in pots. A slightly larger / heavier pot can be a solution for this. Large pot sizes are more difficult to find. In the garden centre you will normally manage to find large black containers with handles. These may not be the most beautiful, but they are the most practical when the plant needs to be moved from time to time. When choosing a pot, remember that palms like to root deeply. Height is therefore especially important. Succulents, on the other hand, root superficial but but more widely. So the depth there is less important. At specialized webshops you can find narrow tall grow pots for palm trees. These offer enough depth for the pen root and require little space. However, at a certain point in time, you will reach a maximum. After all, a pot that is too big can be too heavy to be able to move around easily. In that case, the plant can be perfectly grown in this maximum pot size as long as the potting soil is changed regularly. This can be done by replacing the top layer of potting soil annually.